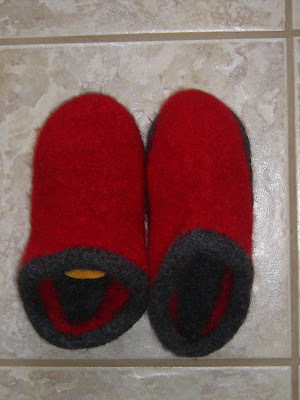 I was very excited to have a pair of my very own slippers, but alas, it was not meant to be. They are too small for me and my son has claimed them as his (they are too big for him but his feet are growing and mine are not shrinking...) So back to my stash I go, to pick out some colours for another pair of clogs and cross my fingers that this time they will stay mine. oh, no!!! Can't you try getting them wet and stretching them? What a shame. They look awfully nice, anyway. Did you make the women's M? 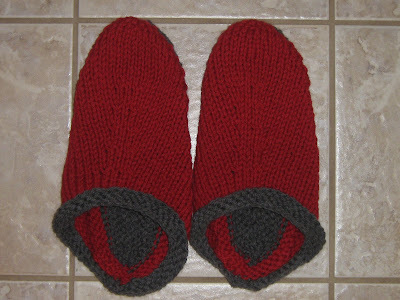 At least you have 3 - 4months to knit another pair before the cooler weather drives you back into slippers! Knit on! !